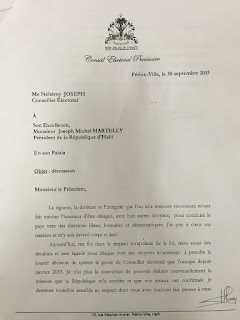 On Friday October 2, Provisional Electoral Council (CEP) member Nehemy Joseph submitted resignation letters (images below) to both President Martelly and his colleagues at the CEP, in a fresh blow to Haiti’s electoral process. Dogged by criticisms over the fraud and violence-plagued legislative elections on August 9, the CEP has suffered from a crisis of confidence as many political parties and civil society groups continue to demand the resignation of its president, Pierre Louis Opont and other changes before presidential elections October 25. 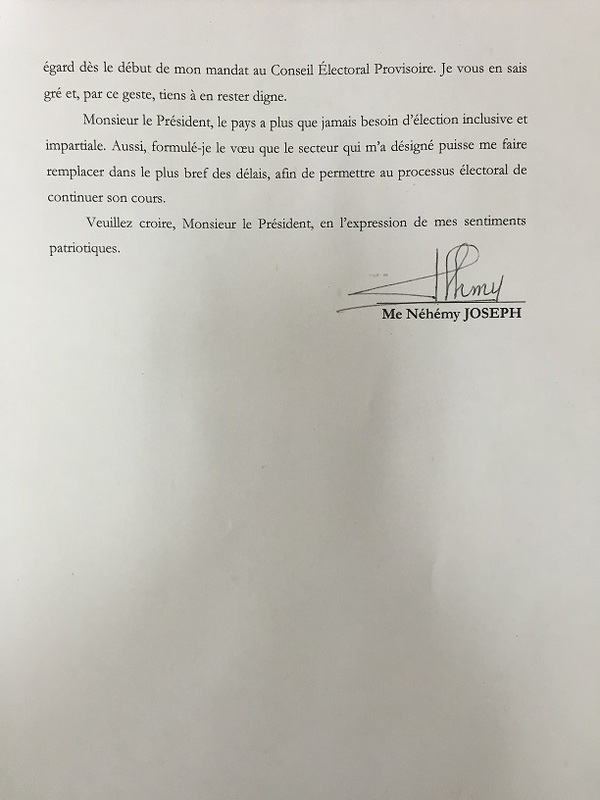 Joseph told president Martelly that he was “not comfortable” staying at the CEP any longer. In his letter to the CEP, Joseph cited his unsuccessful attempts to persuade his colleagues to correct what he perceived as errors and the public criticism of the institution as reasons for his departure. Joseph also singled out the United Nations Development Program’s control over the electoral budget as a factor impeding the work of the CEP. "Today, I am increasingly convinced that completing my mandate would involve me in illegality. (I feel that my credibility will end up melting away like an ice block if I do not leave.) Indeed, the various unsuccessful efforts I made to persuade some of my colleagues to reconsider certain decisions made in error are, among others, factors that have deepened my concerns ... It is natural to make mistakes, but to persevere in error even while recognizing it as such can prove to be pathological," Joseph wrote. Nevertheless, Joseph concluded by stating that he hopes the electoral process will continue smoothly. Political insiders had expected the announcement for at least a few days. 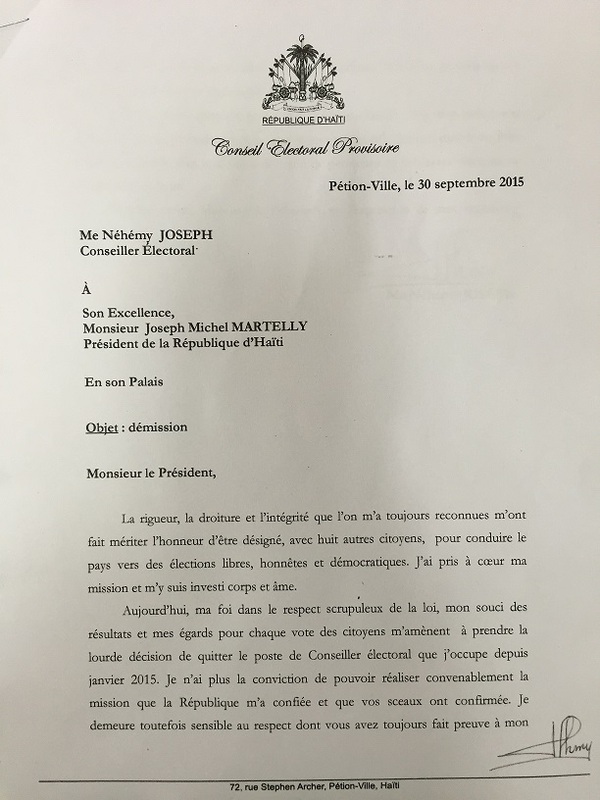 Joseph is “someone not willing to go down in a sinking boat at whatever the cost,” one political adviser close to president Martelly said, requesting anonymity. The adviser expected the election to proceed as scheduled, though acknowledged he was less sure than prior to the resignation. The decision raises the prospect of other councilors following Joseph out the door, which could put the continuation of the electoral process in jeopardy. 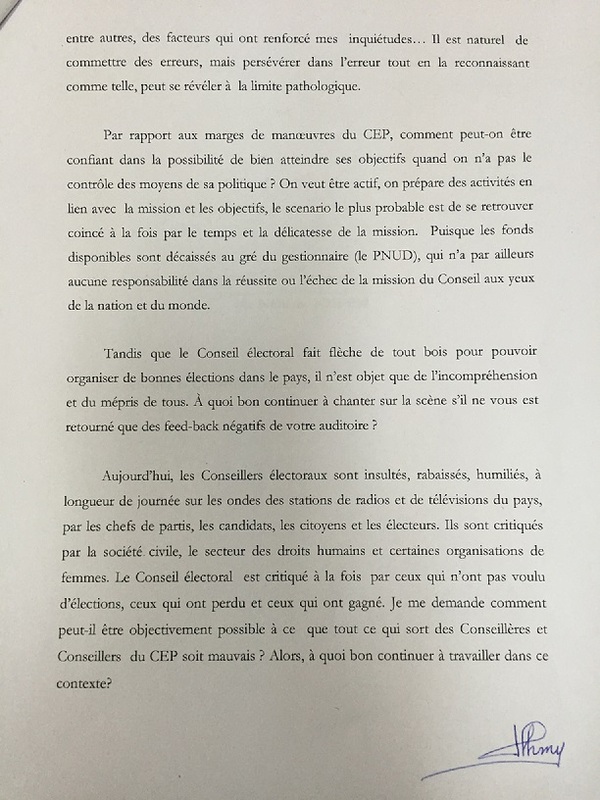 The CEP and the Martelly government insist that elections will go ahead as planned. 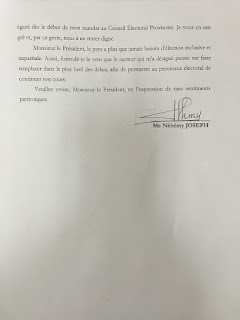 "This will not affect the work of the CEP," fellow council member Ricardo Augustin told the Haitian press in response to Joseph’s resignation. Jean Renel Sanon, a representative of the National Palace said that the government would be in communication with the Peasant/Vodou sector, which had nominated Joseph to the post, to find a replacement as soon as possible. The electoral decree passed in March stipulates that the CEP can continue to function so long as a quorum of 5 members is achieved. A grouping of opposition political parties, politicians and movements, which are advocating for a cancellation of what they call the "electoral farce" of August 9, applauded Joseph’s resignation. Some members of the grouping also demanded an investigation into allegations of corruption within the CEP, especially as it concerns the announcement of final results from first-round election. Weeks after the electoral schedule had called for final results to be announced, the CEP posted them online on Sunday, September 27. Rather than lead to greater clarity however, the final results only added to the confusion. In two departments, the Artibonite and Ouest, it was announced that Senators had won in the first round despite many areas needing to re-run first round elections because of irregularities on election day. In contrast, in the other departments, the CEP did not publish Senate results pending the outcome of reruns. In Washington D.C. for an event in Congress, CEP member Yolette Mengual defended the final results and said the decisions on Senators winning in the first round was a court decision and not that of the CEP. Mengual was a member of the electoral court which ruled on the Senate race in the Artibonite. Joseph’s resignation comes just days after evidence of internal rifts in the CEP surfaced. 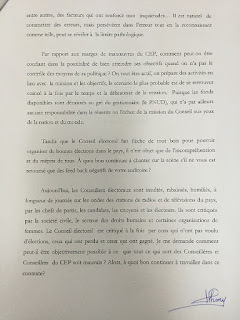 While in public the CEP has maintained a united front, an anonymous CEP official told Le Nouvelliste that there were in fact two main camps in the electoral council, one of which generally sides with those close to the government. 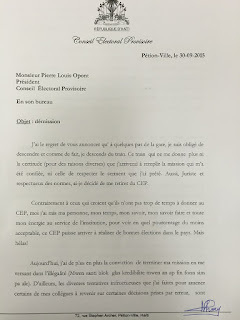 He told the newspaper that he was considering submitting his resignation, due to the harm the CEP’s decisions were having on his public reputation. "I stayed because of the issues. I did not want to play into the hands of those who want a transitional government. 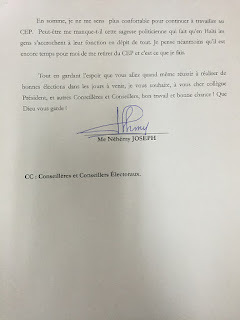 But the way things function with council members clearly serving those in power and other interests, it is hard to guarantee credible elections and credible results," the CEP member told Le Nouvelliste. Several of the CEP’s decisions did not respect the law or have sufficient evidence to be made, such as the exclusion of presidential candidate Jacky Lumarque and Senatorial candidate Arnel Belizaire, the anonymous council member said. Regarding the announced final results, he explained to the paper, "yes, there was influence-peddling, bargaining." Members of the business sector have come out in support of the embattled electoral institution, including the influential Private Sector Economic Forum, whose representative, Pierre Louis Opont, is the president of the CEP. Reginald Boulos, a doctor and businessman from one of Haiti’s wealthiest families, defended the CEP in an interview with Le Nouvelliste, claiming it was "one of the best CEPs we have had." "The CEP is not perfect but it is a CEP that has done its best, perhaps, that has made many mistakes and has acknowledged its mistakes," Boulos told the paper. 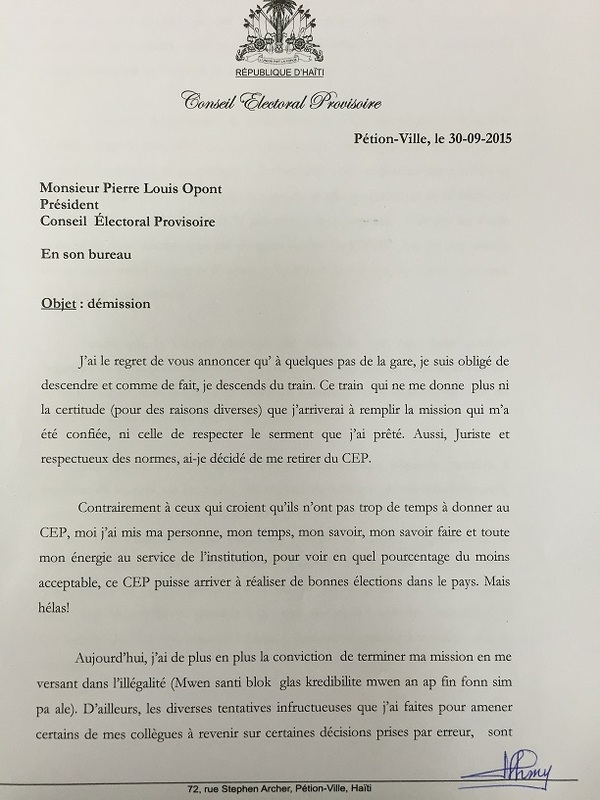 "I heard the president of the CEP say that the Council will make corrections. We should trust that he will make corrections." Boulos was the head of the presidential advisory commission which led to the resignation of former Prime Minister Laurent Lamothe in late 2014 and later the formation of the current CEP. In addition to the violence that significantly disrupted the vote on August 9, electoral councilors themselves have faced physical attacks. Just last week Vijonet Demero, another CEP member, had his house attacked by gunmen, though no injuries were reported. A month before the election, Wilkenson Bazile, an employee of the CEP who had been working with the human rights sector representative, Jacceus Joseph, was shot and killed.